‘[I]n this country, it’s an almost inevitable choice, if one is a historian interested in social change, in local politics, or in the built form of the environment in one way or another, it is natural to be drawn into, or become committed to the study of urban life and its institution.’—H.J. Dyos, 1979. In Shane Ewen’s What is Urban History?, H.J. Dyos looms large as a key figure in the field of urban history. Along with many other historical actors and scholars embroiled in the history of cities, Dyos’ voice comes through in this volume. There are few accessible introductory texts available to students and urbanists with an interest in the history of cities. What makes What is Urban History? not only useful but also engaging is Ewen’s ability to synthesise the international urban historiography whilst also telling compelling urban stories. Ewen’s text is a recent addition to respected British publishing house Polity’s ‘What is … History?’ series. Each volume is written by an eminent scholar, and offers a whirlwind introduction to a particular historical sub-field, suited to the latter-year undergraduate or graduate scholar. No volume thus far exceeds about two hundred pages and each boasts extensive endnotes and an annotated bibliography of further readings. What is Urban History? demands special attention by scholars because there are few accessible texts that offer an introduction to this increasingly relevant field. As Ewen highlights, the city is where the majority of people in the Western world have lived for the past century or so, and rates of urbanisation in the developing world are rapid. Suffice to say, Ewen’s temporal and geographic coverage is extensive. A detailed index reveals that over one hundred cities across every inhabited continent are visited in this volume. Ewen makes an effort to devote equal coverage to his various urban subjects across six chapters that are broadly chronological. The chronology follows the leading historiographical waves in urban history—and more broadly social history—of the past half-century. The volume opens with a short introduction followed by a survey of the field of urban history (headlined by the above Dyos quote). Ewen presents urban history as an interdisciplinary subfield that overlaps with various historical approaches—including social, cultural, environmental and transnational histories—which has also attracted geographers, architects and planners, practicing urbanists and others. These introductory chapters provide an overview of the British, European and North American urban history traditions. At this preliminary stage, there is no mention of the Australasian traditions; a matter returned to at the conclusion of this review. The next five chapters address Cities, Space and Identities; Governing Cities; Cities and the Environment; Urban Culture and Modernity; and Transnational Urban History. The richer chapters are those on identity, governance and modernity, reflecting the strength of the historiography in those areas. Each of these chapters has an accepted historiographical contention. For instance, Ewen suggests that cities are bound to human subjectivity and so urban history must negotiate axes of identity such as class, race, ethnicity, gender and sexuality; with reference to Foucault, that power and regulatory regimes are present in cities; and that the city is bound to modernity, with an emphasis on the archetypal examples of London, New York, Paris and Vienna. The chapters on environmentalism and transnationalism are consciously less resolved. The volume is methodologically pluralist and so attempts to transcend the dominant historiographical debates of the past few decades. For instance, Ewen is unfazed about the conflation of urban with social history. He relates the cultural turn in historical practice to the urban modernity historiography, and then praises the productive scholarship that has resulted, whilst also acknowledging subsequent demands that embodied, more-than-discursive and macro histories are still required. Charting a future course for the subfield, Ewen suggests further urban history studies into the physical environment as well as comparative and transnational research, thereby firmly situating this volume amidst current historiographical trends. As the volume is slight, Ewen feels forced to defend his editorial decisions. He makes explicit that the volume is concerned with the modern city and that there is no distinctive chapter on urban economy (even though political economy informs the whole text), which he acknowledges is not ideal. 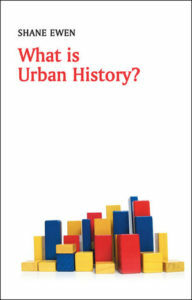 The volume would have also benefited from Ewen identifying his place in the field of urban history. Ewen is a leading British urban historian at Leeds Beckett University, England. He undertook his doctoral training at the University of Leicester’s Centre for Urban History, the spiritual and intellectual home of British urban history. Not until halfway through the volume does Ewen insert himself into the text, in reference to his important social histories of British cities. This volume certainly takes the vantage of a leading British urban historian, facing the British, European and North American traditions. Scholarship on cities in Asia, South America and, to a lesser extent, Africa, provides valuable breadth. Readers of the Melbourne Historical Journal would no doubt be interested in the place of the Australian and Aotearoa New Zealand city in this volume. Numerous Australian and New Zealand scholars are referenced. For instance, Graeme Davison on suburbs, John Griffiths on transnational municipalism, Andrew May on the gendered street, and Alan Mayne on Victorian slums. A telling of the Australasian urban history tradition does not explicitly feature, however. Ewen suggests that the strength of urban history in Britain, Europe and North America is in part attributable to established scholarly nodes and networks that furthered the pursuit of urban history. If the Australasian city is to exert an even greater influence on international urban historical practice in the future, scholarship will indeed need to coalesce at research centres and through specialised academic associations. These comments must not detract from what is ultimately a valuable and timely volume. Ewen’s What is Urban History? is indispensable for budding historians of cities across the world.